​Feeling a bit intimidated in the kitchen? Yes, you could take a cooking class from one of those “big schools” – you know, the ones with the fancy utensils and overly poofy chef’s hats. But how much can you really learn by simply watching from a table with 30 other people? Research (okay, my psych-major daughter) says that if you’re like most people, the answer is almost nothing. My classes, on the other hand, are 3 hours of fun, food and hands-on learning, in a very small setting (1-4 students). They range from the very basics, to the very advanced! Weddings/Anniversaries: remember, food is love! Birthdays: a fun and different way to celebrate – same delicious food, but no restaurant crowds or noise! Class prices start at $180 (total) for 1-4 people (divide that by 4 people and it comes to only $45 per person!) and include all food and recipes. Any food not eaten in class is yours to take home. I also do “mini camps” for high school and middle school students. Contact me for more info. ​How about a party at your home? Wouldn’t it be nice if all you had to do for your next party was choose the date and the guest list (okay, easier said than done) and the rest would magically be done for you?? Call EATSIES and that’s exactly what will happen, with me as your trusty fairy godmother! 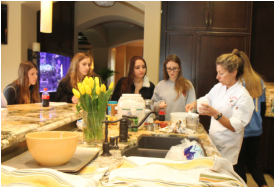 I’ll bring the party to you with a hands-on cooking class, where your guests will not only learn to cook, but will actually prepare the entire meal! Buying chips and dip is SO last year.